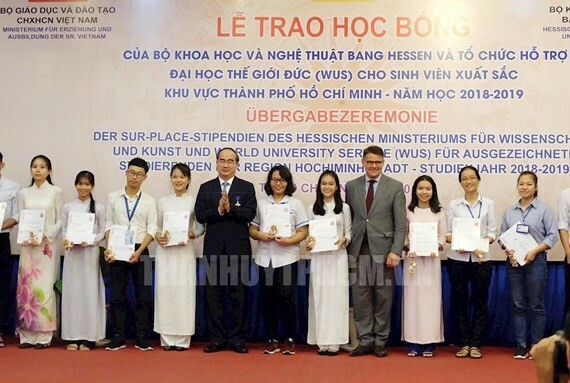 The Hessian Ministry for Science and the Arts and the World University Service (WVS) yesterday co-organized the ceremony to award the scholarships to excellent Vietnamese students in Ho Chi Minh City. Debuted since 1993, Hessen scholarships have been granted to thousands of poor students with good academic performance at universities, colleges and high schools across the country. In the academic year of 2018-2019, the Hessen representative office in Vietnam plans to present 250 scholarships to Vietnamese students nationwide. In his remarks at the award ceremony, Deputy Minister of Education and Training Nguyen Van Phuc said Hessen scholarships have financially supported Vietnamese students encouraging them to try more in their studies and life. The scholarships show the care and concern of the Hessen State and the Ministry for Science and the Arts for Vietnam’s education and training. Hessen State Minister for Science and Arts Boris Rhein, Secretary of HCMC Party’s Committee Nguyen Thien Nhan, and former vice President Truong My Hoa , the president of the Vu A Dinh Scholarship Fund attended the award ceremony.